Bicycle and Granite Sheds - A bicycle rests in a ditch along Berlin Street, Montpelier, Vermont. 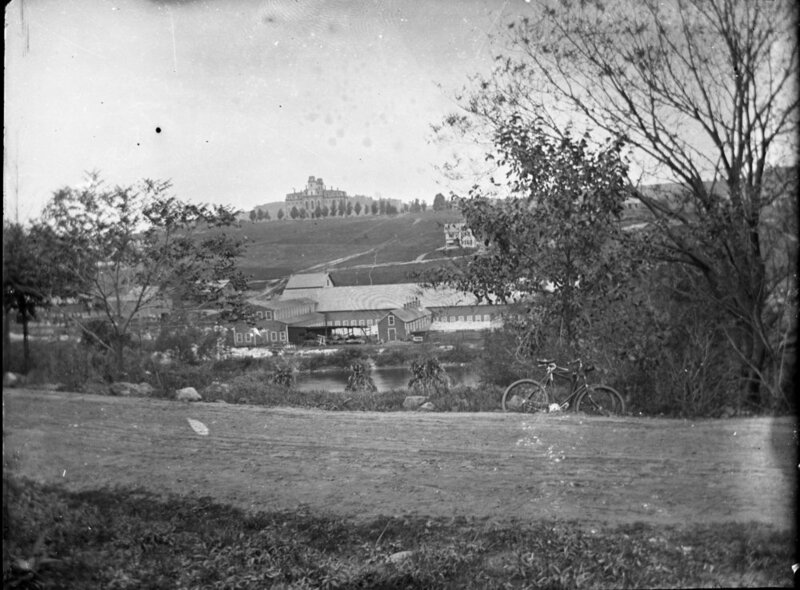 Across the Winooski River is a granite shed and on top of the hill is Vermont Methodist Seminary. The Vermont Methodist Seminary is now the Vermont College of Fine Arts (VCFA). Courtesy the Vermont Historical Society. "The Vermont Book Award is a literary prize administered by Vermont College of Fine Arts that honors work of outstanding literary merit by Vermont authors and celebrates the long tradition of literature in the state.... The winner is announced at the Vermont Book Award Gala, a celebratory evening of music, literature, and creative culture." Greg Delanty was born in Cork City, Ireland, in 1958 and lived there until he made his home in Vermont in 1986. He became a US citizen in 1992. He has lived for more than half his life in Vermont, where he is the Poet in Residence at St. Michael’s College. Delanty has received numerous awards for his poetry including The Patrick Kavanagh Award (1983), The Allan Dowling Poetry Fellowship (1986), the Austin Clarke Centenary Poetry Award (1997), and a Guggenheim Fellowship for poetry (2008). The softcover available care of Small Press Distribution; the hardcover care of Un-Gyve Press.